Bearing for drive shaft, in the gearbox. Suitable for Citroen 2CV6. Dimension: 25 x 52 x 15mm. The bearing is closed. Or. No. ZC 9629 219U. The bearing is behind the shaft seal. 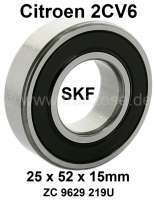 Original SKF!